Sometimes a blank page alone is enough to stop your creative process. One solution? Get some color down! 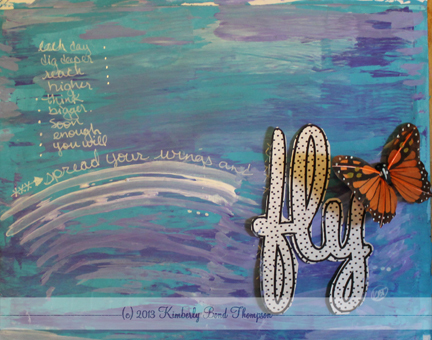 Using cardboard and serrated edges around your house, you can quickly and easily get some color down onto an art journal or mixed media page so that you can go with that creative flow. Take a look at this quick video to see how easy it really is using simply acrylic craft paint. The finished page was completed in about 10 minutes… including drying time. Once the background was down, I simply added a word cut out from some patterned paper and used a white sharpie pen for the writing. Remember, it doesn’t have to take a lot of time to get your creativity on! Thanks Patricia! I have learned how much I like to NOT use a brush to help me keep things loose :).